It’s Groundhog’s Day yet again, Oregon: How’s your climate change strategy working? If it seems like you’ve read this post before at City Observatory, you’re not wrong. For the past couple of years, every Groundhog’s Day, we’ve stuck our heads up and looked around to see whether anything has changed when it comes to coping with the growing crisis of global warming. Once again, we find ourselves in the same predicament as Bill Murray in the 1993 movie, Groundhog’s Day–waking up every morning to discover that it’s still February 2, and that he’s done nothing to change any of the behaviors that have messed up his life. The original inspiration for our Groundhog’s Day commentary was the 2017 report of the Oregon Global Warming Commission, a body set up to monitor how well the state was doing in achieving its legally adopted goal to reduce greenhouse gas emissions by 75 percent from 1990 levels by the year 2050. The short story two years ago was: Not very good. Although the state reduced some power plant and industrial emissions, nearly all these gains were wiped out by increased driving. The 2017 Legislature that received that report not only did essentially nothing in response, it arguably laid the groundwork to make the problem worse, by approving a new transportation finance package providing upwards of a billion dollars to widen Portland area freeways. 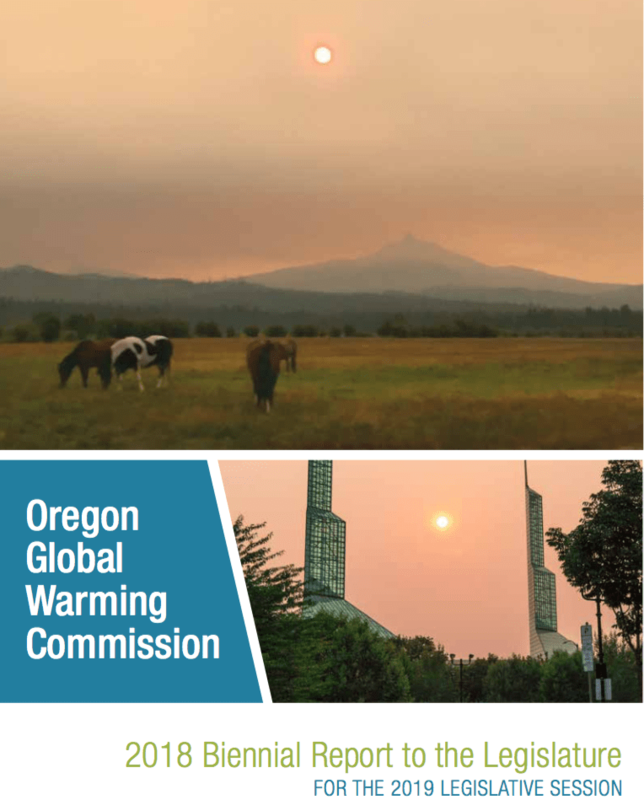 So it’s little surprise, really, that the new 2019 Oregon Global Warming Commission report tells us that in the past two years we’ve made no progress toward reducing our state’s greenhouse gas emissions. The stark reality of climate change was brought home in the late summer of 2018, when massive forest fires in California choked most of Oregon in acrid brown smoke, a fact captured on the cover of the 2019 report. The reasons for the growing problem are itemized in the commission’s biennial report to the state Legislature. In addition to its goal, Oregon has a tiny citizen commission charged with riding herd on the state’s emissions inventory, and looking to see what, if any progress the state is making in reducing greenhouse gases. The news is not good. Oregon’s emissions are rising. And the culprit is clear: More driving. Here’s the verdict from the commission’s report. As a result of the growth in driving and related emissions, and slower than expected progress in reducing emissions from other sources, it looks like there’s no way the state is anywhere close to the path it needs to be on to reach its 2050 goal. Transportation emissions, which are now the single largest source of greenhouse gases in Oregon, are actually increasing from their 2010 levels–at a time when the state’s climate strategy called for them to be declining. 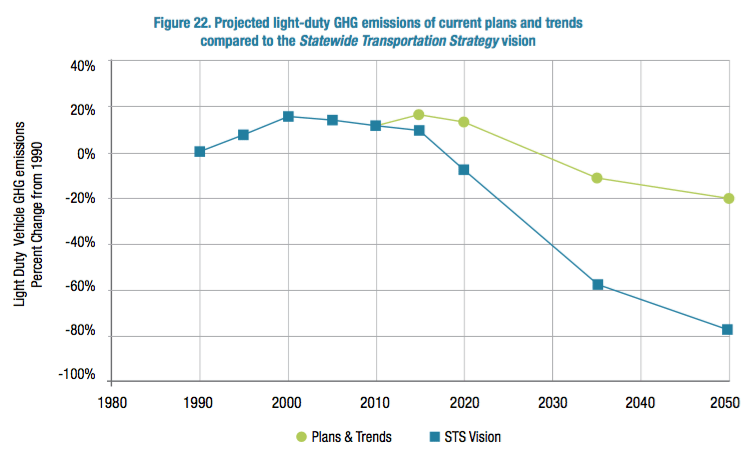 (The blue line is the glide slope to achieving the state’s adopted 2050 goal, and the pale green line is the estimate of where the state is headed). The best estimate is that rather than the eighty percent reduction from 1990 levels that the state has set as a goal, we’ll see barely a 20 percent reduction by 2050. In the best of all possible worlds, this warning would prompt the Governor and legislators–ever mindful of their legally enacted commitment to reduce greenhouse gas emissions–to redouble their efforts and figure out ways to discourage carbon pollution, especially from transportation. After all, Oregon’s government passed a law mandating a reduction in greenhouse gases. Oregon was, in fact, one of the first states to set its own local goals for reducing greenhouse gases. In a law adopted in 2007, the state committed to reducing its greenhouse gas emissions by 10 percent from 1990 levels by the year 2020, and the further goal of reducing them by 75 percent by 2050. Many other states and cities have similar adopted goals. Around the nation, much hope is being placed on the continued rhetorical commitment of many mayors and governors to achieving these reductions and thereby making progress to holding up America’s obligations under the the Paris accords. Ardent proponents of “The New Localism” tell us that even if the federal government ignores climate change, state and local leaders will get us on the right track. The Hippocratic Oath directs physicians, first, “to do no harm.” The same ought to apply to state and local governments who profess to care about climate change. If we know driving is the biggest source of carbon pollution, and it’s causing us to increase emissions when we need to be decreasing them, the very last thing we should be doing is expanding freeways, which encourage people to drive even more. That’s why we think that Portland area freeway widening projects like the proposed half-billion dollar expansion of I-5 should be taken off the table. That money–and billions of dollars in other subsidies to automobile transportation, would be far better spent in building communities that are designed to enable low carbon living. The International Panel on Climate Change has made it clear in its most recent report that we’re rapidly approaching a point of no return if we’re to avoid serious and permanent damage to the climate. We’re going to need something more than soothing rhetoric and distant goals to avoid dramatically altering our planet. We’d like to believe that things will be very different next Groundhog’s Day, but alas, we’ve seen this movie before.